These zori are great, and also make great gifts. 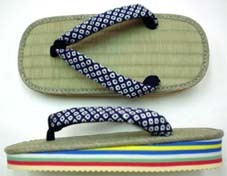 You can customize your zori by choosing your favorite hanao design from my collection of hanao. What are the "rush mat zori" ? They are a modern style of Japanese footwear that are very popular among young people. The soles of the zori are made from rush mats that make the feet feel nice and cool. I named them "rush mat zori" as they are my original hand-made zori. 1.It is possible to have your favorite hanao (thong) attached to to my rush mat zori when you buy them. 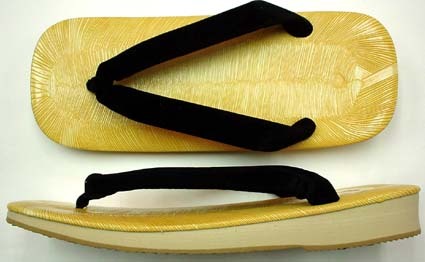 In Japan, we usually buy zori at a geta-ya, but normally we can not choose a favorite hanao. 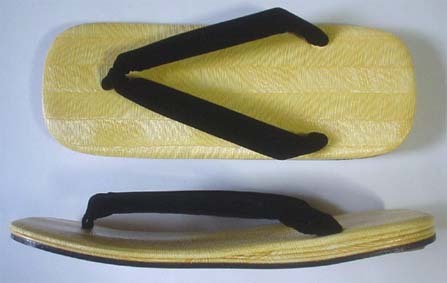 Hanao are aleady fixed to zori and usually come in two or three colours at best - black, white or red. The reason for this is because they are made by machine in large quantities. My shop was selling rush mat zori too, stocked from a wholesaler. Customers frequently asked me to fix their favourite hanao to the rush mat zori, but sadly I had to refused their request with, "I'm sorry..." Just then I thought, in the words of John Maynard Keynes, "A way can be found! ", meaning to face up to a problem. Soon after, I made my original hand-made rush mat zori. Customers can choose their favourite design from my various coloured and patterned hanao, and I can attach it to the zori while the customer watches. I think this approach will start a new trend among geta-ya. 2.Many Japanese people love the feel of rush mat zori. Do you know of Japanese-style mats, or tatami? Tatami are made of rice straw and covered with rush, or a type of grass. The woven rush in tatami makes tatami feel nice and cool, and they make Japanese-style rooms very comfortable in the humid Japanese summer heat. 3. Rush mats invigorate your feet and are good for your health. For rush mat zori, ※it is a hanao-inclusive price. You can choose your favorite design for your hanao from my collection. 30cm zori is black hanao only, because I do not have long enough hanao for 30cm zori. 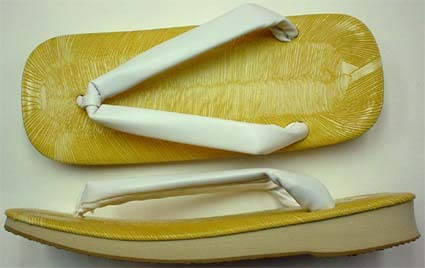 Have you ever slipped and fallen when you wore ZORI? The sponge is slippery on a wet floor. Please be careful when walking with zori!!!!! Copyright (C) 2001 Akai-hanao-no-jojo. All Rights Reserved.